So far, I have gone 1672 km and been on the bike for 105:55 hours. 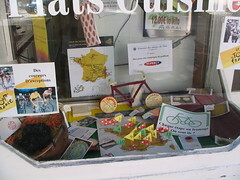 I am in Digne today, waiting for the tour to come tomorrow, and this town is READY! 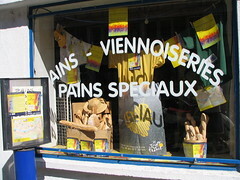 most of the shops have a display, or at least a flyer up. Did you know that every stop on the tour has a cheese associated with it? The most I have stayed in one town is 2 nights, and I usually get ancy when I don’t ride, but I am making an exception to see the tour and staying in Digne for 3 nights. Tomorrow, I think I will try to bike up to the Col de L’Orme, which is 734 m and about 9 km from the finish. I think it would be better to see the racers climb than be in the city for the end, struggling through the crowd to see the racers come through. your smile gets bigger every day! What a wonderfull travel you are doing, and courageous! After near a little town called Oraison, There is Entrevennes little little village among lavender, there, vero and robert live with their 2 little girls, they come back Monday 21th, if you need a farmer conctact, ask me! there is Mathieu in Banon, Bertrand in Sault (they’re very kind and funny) they work on international camps of dry stone. After in Malaucene one of my best friend , Christine ( english teatcher) is a fan of biking ( she has done Usa and Corse in Bike), I ve talked her about you, she enjoys to meet you. Ann d’orange but for friends it is Anne-Lise. wow! I bet the tour was amazing! we’ve been watching it here and it’s cool to see where you are. I love reading your updates. I mirror was Roscoe says. As time goes on your smile gets bigger and bigger. Its absolutely fantastic to see. How was the tour? Crazy I bet.